By the end of 2010, MSF has estimated it will have spent all of the $138 million donated by private supporters for Haiti. Questions? Join our live webcast in which MSF will answer questions about the organization's massive medical response in Haiti. MSF received massive financial support for the Haiti emergency from hundreds of thousands of donors around the world. By the end of 2010, MSF has estimated it will have spent all of the €104 million1 ($138 million) donated by private supporters for Haiti. MSF estimates that it will have spent a total of €94 million ($124 million) on the earthquake relief effort in 2010. The remaining private restricted funds raised for Haiti (approximately €10 million, or $13.2 million) will have been used to mobilize MSF’s cholera response. As of October 31, MSF had spent 76 percent—some €79 million ($104 million)—of these restricted funds in the first 10 months following the disaster. 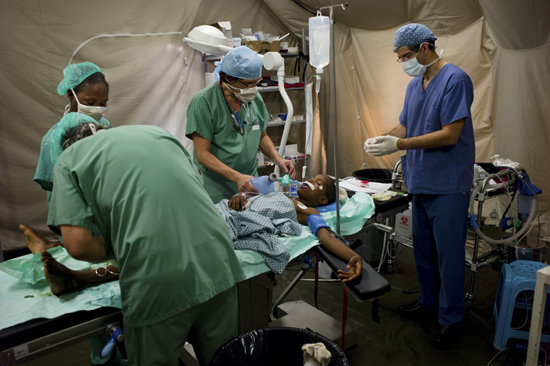 Operating such large-scale emergency health programs requires a range of investments. Given the devastation in Port-au-Prince and beyond, including the near-total destruction of many health centers and hospitals, over 20 percent of MSF’s expenditures as of October 31 were devoted to logistics, such as the rehabilitation or construction of medical facilities as well as the distribution of shelter materials and the building of latrines. Without this investment, medical staff would not be able to operate and patients would not receive the scope and quality of treatment MSF offers. 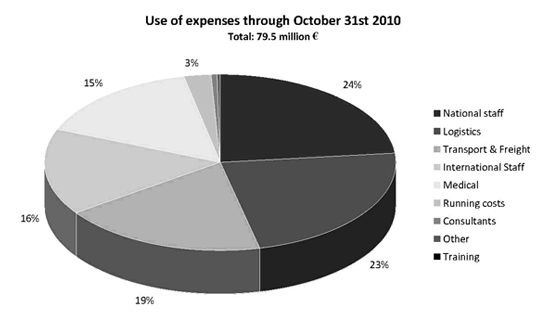 A further 15 percent of MSF’s expenditures were attributed to the medical category. This includes medical supplies and equipments such as drugs, vaccines, surgical kits, hospital equipment and maternity health supplies. Given the medical nature of the intervention and the unprecedented level of deployment of national and international staff, both staff categories account for a significant amount of expenditure (almost €32 million). They include all the related expenses for the more than 8,000 (mainly medical and logistics) staff that have participated in the intervention. Because vast amounts of relief goods had to be brought into Haiti, transport and freight accounted for 19 percent of the total spending through October 31. 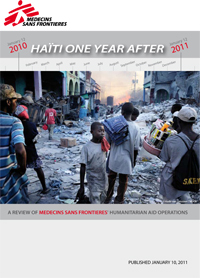 Running costs includes expenses related to all MSF offices in Haiti. All these expenditure lines contributed to achieve a number of emergency assistance activities. To give some examples, the amount dedicated to surgical and post-operative care amounted to €17.2 million ($22.7 million) through October 31, while €10.1 million ($13.3 million) were dedicated to maternal health and €11.7 million ($15.4 million) to the distribution of shelter and non-food items.